My current favorite spice masalas are Shan's Haleem Mix (for cooking meat and pulses gravy) and Priya's Biryani Masala Powder (both available in most well stocked Indian grocery stores). Check out my Amazon store on the side to research them. If you are planning to stock up, I recommend that you get both of these as they extremely versatile in their purpose and can be used in a variety of dishes, rather than the specific use mentioned in their packaging. Why do I like them so much? because they are really different from the masalas available from the other manufacturers such as Everest and Badshah (should start calling them Bad Shah), and bring a totally new taste to one's palate. 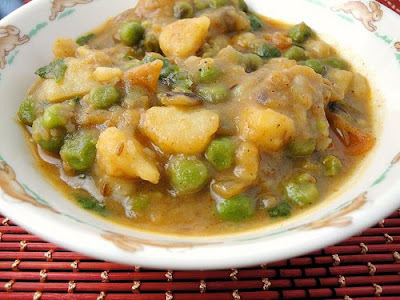 I cooked two quickfire dishes this week, starting off with this really easy but very tasty potato gravy to accompany the puris (mini chapatis deep fried instead on cooking them like tortillas) that my wife made. I was done making this in 10 -15 minutes or so, and it turned out to be really delicious. Boil the potatoes the old fashioned way or in the microwave until cooked, smash and cut them into small pieces. Cut the onions and tomatoes, and have them ready as well. In a pan on medium fire, add the oil, hing, cumin seeds, red chili powder and cook them for a few seconds before adding the onions. Cook the onions until translucent, and add the green peas. After a few minutes of cooking, add the tomatoes, Shan Haleem Mix powder and mix everything well. After a few minutes, add the potatoes and mix, adding water at the same time. Integrate everything well with a spatula, add the fresh coriander leaves and cook until it has the consistency of a semi liquid gravy. Turn off the fire and add the lemon juice to the gravy. Mix well and serve hot with puris/chapatis.